Targeting a niche market, but bearing a high import tariff, Russian cars seem to have lost their luster in Vietnam. In 2017, the legendary Russian UAZ cars models Hunter, Patriot and Pickup appeared n the market. Many Vietnamese people who love UAZ, famous for its strength and durability, once lived and worked in Russia, and are sympathetic towards Russia and Russian products. Russian cars have seen prices drop by 30 percent. 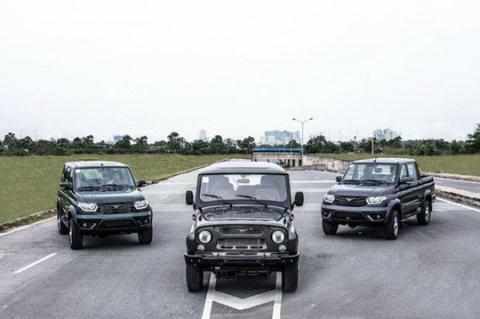 UAZ Hunter, for example, is selling for VND360 million, while it was no less than VND500 million in early 2018. In 2018, Russian cars continued to attract Vietnamese buyers amid market fluctuations caused by the tariff cut on imports from ASEAN to zero percent. More UAZ Patriots arrived in Vietnam, including those from the order of the Ministry of Public Security and those delivered to businesses to serve tourism. However, since the beginning of 2019, AutoK, the official distributor of UAZ, has not released any news. A representative of AutoK said the Russian brand targets niche markets where there are Russian car and Russian product lovers. AutoK said it never put high hopes on commercial sales. The Russian cars imported by AutoK bear a high import tariff of up to 55 percent, not the zero percent tax as expected. To attract more customers, the importer chose to import the basic version. In Vietnam, buyers can install other parts of cars or re-decorate as they want. AutoK said UAZ Patriots are running out, while a low number of UAZ Hunters, priced at VND360 million, are still available. However, though offering sharp discount rates, the model cannot attract buyers. “AutoK will stop importing UAZ in 2019,” the representative said. Meanwhile, some analysts say that UAZ and Russian cars cannot attract Vietnamese buyers because of the problems in post-sale services. “Vietnamese want full services, which means that distributors have to have maintenance units and sales agents. AutoK still cannot satisfy the requirements,” a man wrote on a auto forum. Anh Duc, the owner of an auto salon in HCM City, said the demand for UAZ exists in the southern market. However, the high transport cost and the strategy to sell cars with many options has turned away buyers. “In general, people don’t need many options if they just want a pickup to climb the mountain or go out. So, selling cars with minimal options is a reasonable policy,” Duc said. The prices of automobiles remained high in spite of the import duty on completely-built-up cars imported from ASEAN markets falling to zero from 30% in 2017.